Welcome home to 6000 Stimson Rd in Eaton Rapids. 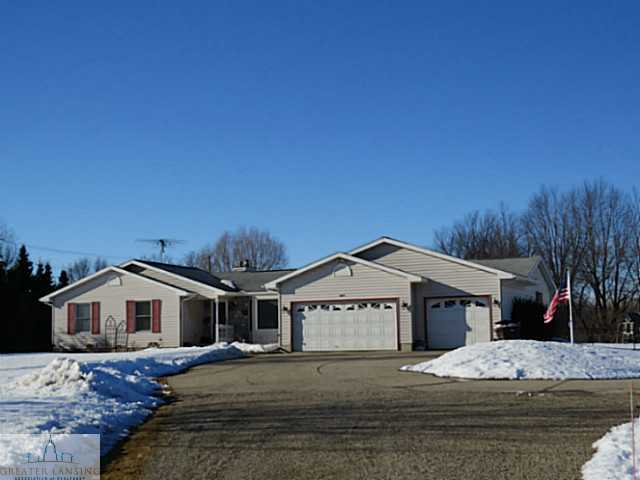 This ranch home is situated on 2.86 acres with a shed and pole barn, perfect the all the toys! The main level features an open floor plan, allowing you to experience the spaciousness of the living room, kitchen, and dining room at the same time, gleaming hardwood floors in the living room, dining room, and hallway, newer carpet in bedrooms, first floor laundry. The main level also features a master bedroom, bathroom suite, 2 additional bedrooms and additional 1.5 bathrooms. Workshop and storage area in the full basement which is stubbed and drywalled and also features the 13X22 4th bedroom with 3 egress windows! For additional information on this property click here! Posted on March 19, 2014, in All Other Listings. Bookmark the permalink. Leave a comment.